Quite often, when things get quiet around me and I have time to think, I frequently find myself just astounded at my good fortune. Not in monetary terms by any means but by the friendships and acquaintances that have appeared in my life simply as a result of being a trout bum in the right place at the right time. Most all of us have icons whom we look up to in some degree and in the past ten days I've had an unusual run of most interesting angling partners. 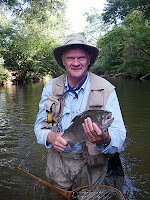 To start with, myself, Henry Cowen and Rex Gudgel spent two days trout fishing at Nacoochee Bend and Frog Hollow with Lefty Kreh and Dan Blanton. Lefty, of course, requires no introduction to fly fishing enthusiasists. When you Google his name, over 70,000 results pop up. Dan, while not a household name in flyfishing the southeast, is a prominent writer for most of the fly fishing magazines we read and a top guide for stripers in the bay areas of California south of San Francisco. 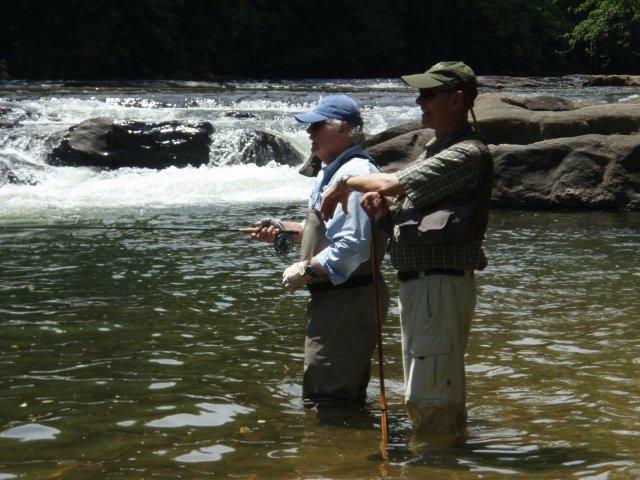 My memories of these two days were simply that it was as comfortable as fishing with two lifelong friends. There's never a dull moment when Lefty's around and fishing with Dan is like fishing with a brother. Two terrible knee injuries in the past couple of years have put a crimp in Lefty's mobility but when he's on-stream, it's an education just to watch him work. He was blown away by Frog Hollow and has plans to come back and photograph what he called " the most picturesque trout stream I have ever been on east of the Mississippi". 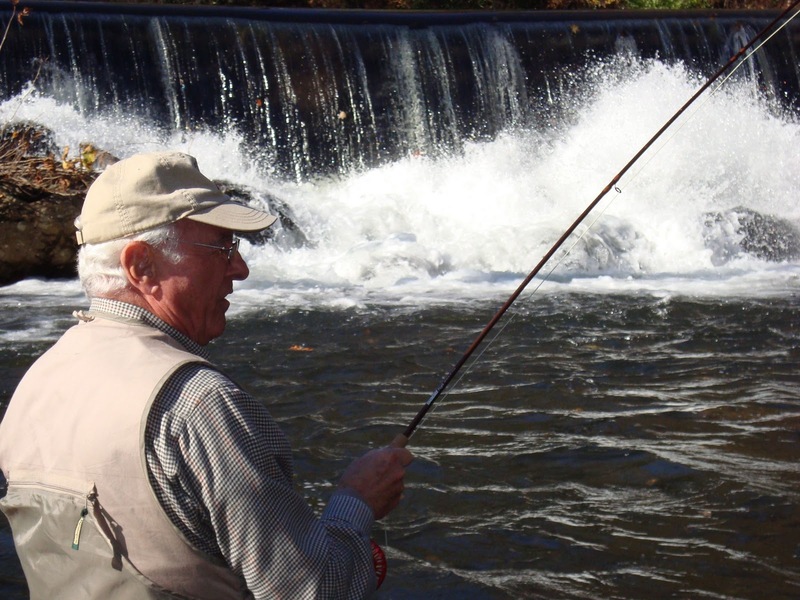 Dan was just as exuberant on his blog as he posed the rhetorical question of "Where else can you fish for stripers in the morning and trophy trout in the afternoon?" Friday, the 28th was my last day with these two giants of our sport but the following Wednesday found me at Nacoochee Bend with Loran Smith of UGA Bulldog fame and baseball Hall of Famer Phil Neikro. The stories these two guys have to tell are unending and I'm always in stitches when I'm with them. They literally know everyone who's ever been a major player in football and baseball in the past 50 years and I think they have a story about all of them. Loran, of course, is best known for his sideline commentary during UGA football games but he is also a prolific writer with weekly columns which appear throughout Georgia in over 30 newspapers and he's authored so many books the Dewey Decimal System has lost count. They are both great gentlemen and I consider it a privilege to host this event for them every year. Finally, on the Sunday afternoon after the tremendous Fly Fishing Show at Unicoi Lodge in Helen, I find myself in the Chestatee River at Frog Hollow again. 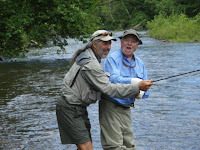 On this beautiful early summer day, I'm standing next to another of fly fishings most famous anglers, Gary Borger. 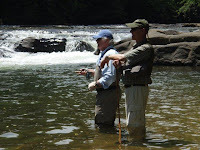 Gary is another angler who needs no introduction to the fly fishing community. His books, articles and videos are among the most well respected in the field and if you want to know about any aspect of fly fishing, you won't find a better source than Gary's work. At the moment, he's working on a series of 20 books which will deal with a wide variety of angling topics. He promised to include a chapter titled "Shrimp and Grits" after dinner at Nacoochee Grill. On Monday, I drove Gary back to Atlanta Airport and we had more time to discuss life, fishing, travels, attracting new fly anglers (he thinks we need to be cultivating the next generation as early as elementary school and I believe I have to agree with him), and bread making. Yep, bread making. Gary has become somewhat of a craftsman with artisan breads and he's already sent me his favorite no-knead recipe that I can't wait to try. My fortune during these few days was to discover what a pleasure it was to spend time with every one of these guys, standing in a river enjoying life and trying our best to fool a critter with a brain the size of a pea. And to a man, you could see the light in their eyes when a fish rose to their fly, whether it was a trophy or a nine-incher. How fortunate can an old trout bum be? For me, very.